The weather has been beautiful the past two months or so, and we have been taking advantage by being outside more. 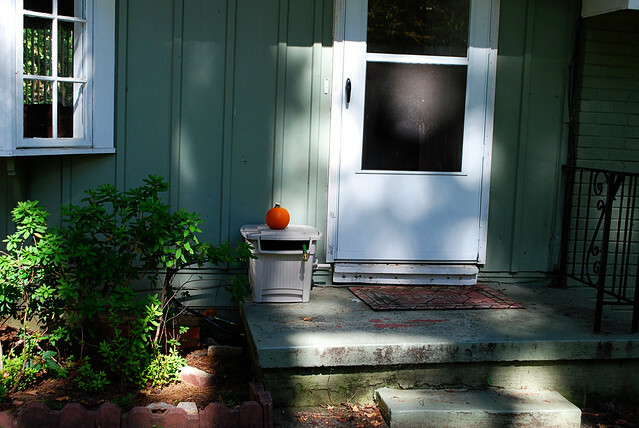 I don’t really enjoy being outside when it’s not pleasant, and that probably shows in the overall cleanup of our house during the summer and winter months. So, it’s good for me to spend the time and energy to make up for it. I cut a lot back from the other pine island, but you can’t really tell. The thorny vines were worse on that side, so it was tedious, but I think it’s a good start. Another thing I started doing was quickly pulling out the hose and spraying down the front of our house where the spider webs are going crazy (around our front door). It has really helped and doesn’t take too long. However, our house was at an awkward place just sprawling around the front stoop, so I decided to get one of those hose hiders from Home Depot. Because of the azaleas, I couldn’t put it on the ground, but I think it actually looks nice to have something on the front stoop. I stuck the little pumpkin there for now, but we hope to get a big pumpkin soon. I think it looks very nice! 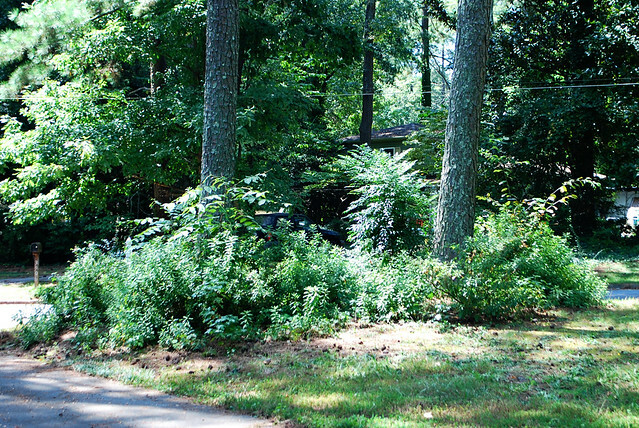 My sister was visiting, and while she was here did a lot of work to cut back the azaleas – she couldn’t find the original bushes. 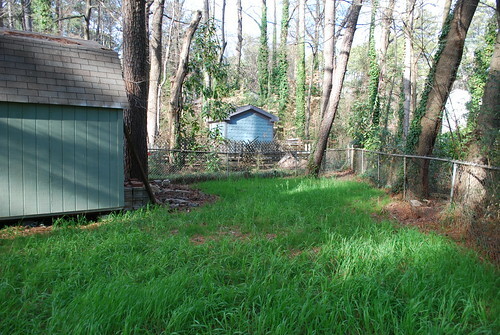 It seemed to her that a layer of mulch/dirt/pine straw was placed over the original bush, or something like that. She didn’t have enough time to finish, but she did get it cut down and thinned out a lot. I took this picture today. 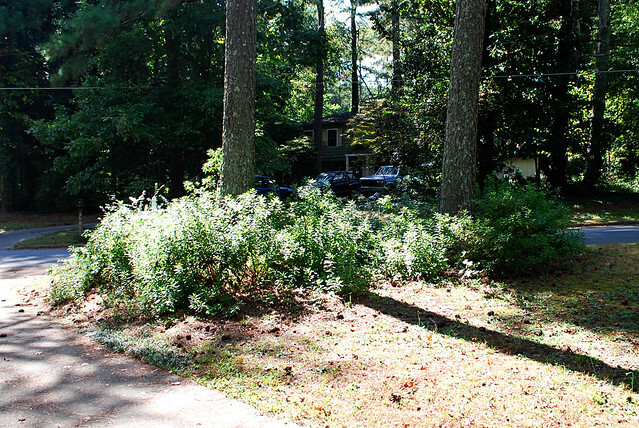 We still need to do more, especially with removing all the non-azalea plants. But for now, this is good. 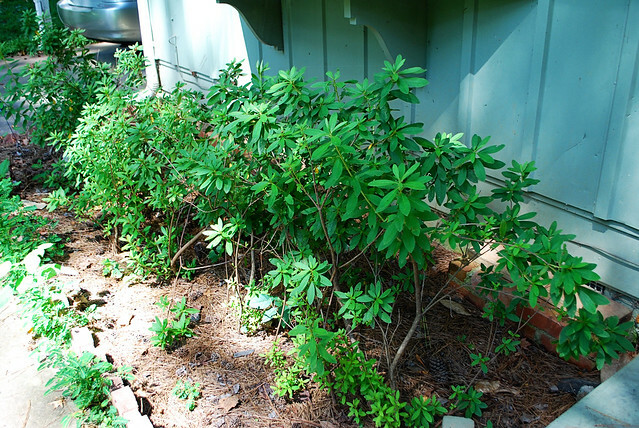 As far as the parts that my sister cut off – she transplanted them to the front flower bed under our bay window. We weren’t sure if they would take, but this past spring they bloomed! And I noticed today that there are new leaves, which should hopefully fill out the whole area. I’m excited for how it looks! We went on a little jog down to Orlando this weekend for my nephew’s 1st birthday! We had a wonderful trip. My brother and sister-in-law just moved into their new (old) house and I look forward to seeing what they do with it! Perhaps it will inspire me to work at decor in our house. Coming home we were greeted with a slew of issues, which is frustrating. Shortly before we left, we noticed our bathtub is leaking. We didn’t have time to deal with it before, so we need to figure out the problem and best solution now. The downside of having only one bath/shower! Fortunately our local Y (where we are members) has showers available. Speaking of plumbing, we also came back to a dripping kitchen sink faucet. It wasn’t dripping before we left, and it isn’t bad, but it’s still something that needs to be dealt with. The last annoyance is our stairwell light is burned out. I know, very minor, but involve dragging a chair upstairs and taking down the light fixture. I’m mostly exhausted all the time which makes these types of projects difficult. I’ll post pictures of our new mailbox once it’s up and my camera is back from the repair place. 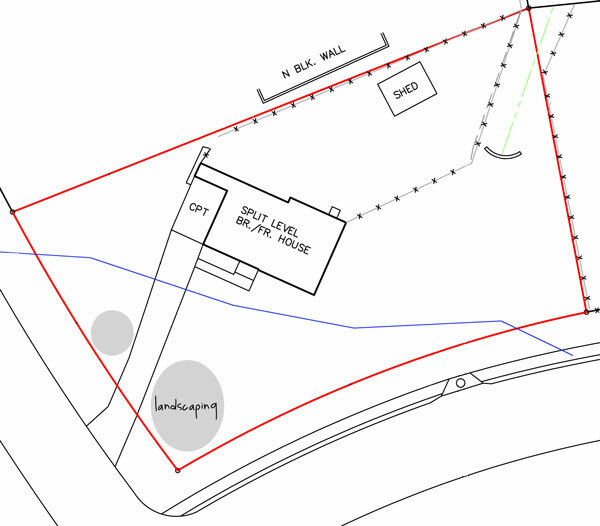 I spend a lot of time daydreaming what I’d like to do with certain problem areas around our house. It tides me over while we’re in a position that we can’t really do anything, heh. One problem area: We live on a corner lot. Apparently, people seem to think that means that we are totally fine with them cutting off the corner and walking right through our yard. This drives me nuts. I feel like it’s rude and it makes me uncomfortable that they walk so close to our house. 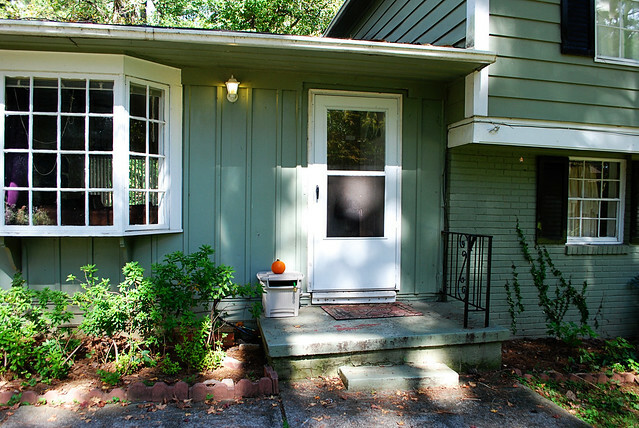 (How easy would it be to grab something off the carport?) Also, I worry a little that by letting someone on our property and not doing anything to stop it might invite a potential lawsuit later if they should injure themselves somehow and sue me. Yay, America and our court system. I’m sure that isn’t a very common scenario, but I’ve also been around enough people who have found themselves at the wrong end of a lawsuit to know that fighting something like that is tedious and expensive. Doesn’t it look nice and inviting to cut across? And by the way, 99% of the people cutting across the property are adults. I actually have only once seen kids cut across. So they are very definitely people who should know better! First off, I’d like to remove the two random bushes. I don’t know if they can be moved to elsewhere in our yard, or if we should rehome them. I’ll have to look up what kind of bushes they are. 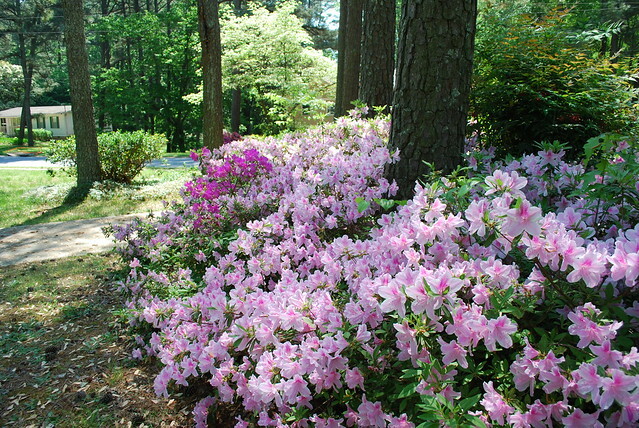 :-) On the left side of the picture, you’ll see some gorgeous azalea bushes. I think they’re beautiful, but they are not in a good spot in our yard. It’s very difficult (read: impossible) to see if anyone is coming when you are backing out of our driveway. Also, if a car parks behind them, I can’t see the car at all from the house or the driveway – which makes me nervous and a safety hazard in my opinion. 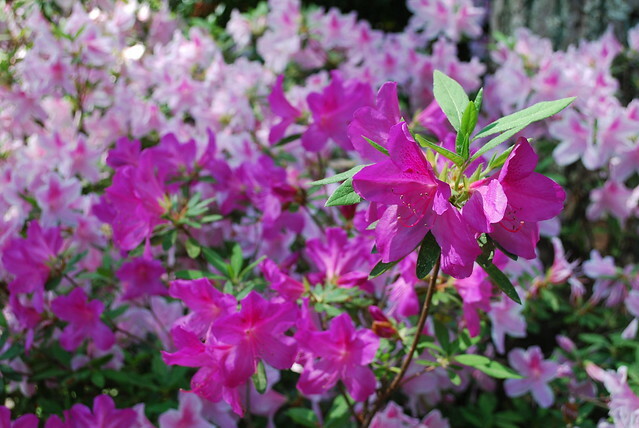 So transplanting the azaleas is something that needs to happen regardless. So what do you think? 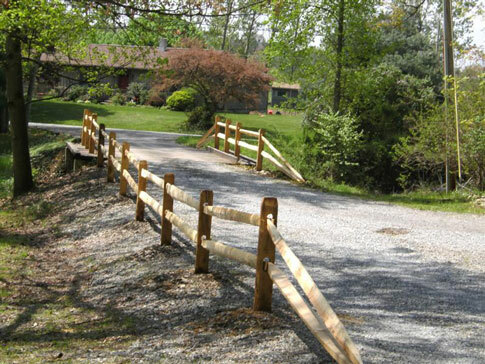 Do you prefer ranch rail or split rail? 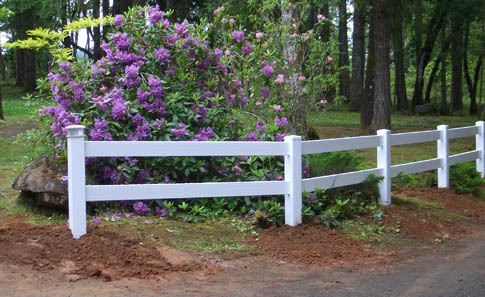 (Picket fence would also work, but it seems a lot more expensive.) What flowering vine would look nice? Paul found the charger to the camera battery, and I was finally able to take pictures today! We got the seed laid around the end of October. In retrospect, that wasn’t the best idea, because then all the leaves fell and we were unsure of how to rake them up without disturbing the new seeds. We were worried if we *didn’t* rake them, then it would hurt the ability of the seeds to grow. 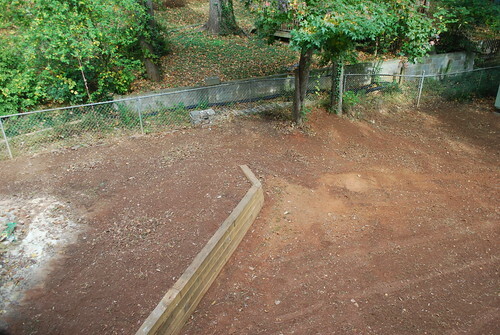 I did rake parts of the yard, and I have noticed now that the parts of the yard I didn’t rake look more sparse. If I remember correctly, with this type of grass we will need to reseed every spring – I need to investigate that more thoroughly though. You can see the areas where they graded the dirt. 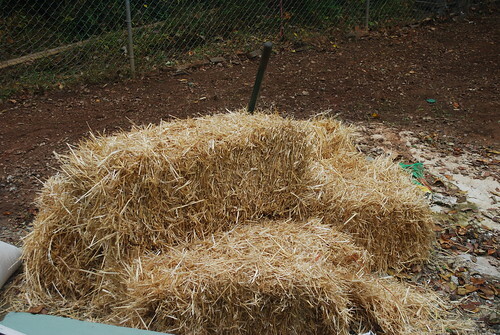 Then they seeded, and put straw down! Then came the task of watering. 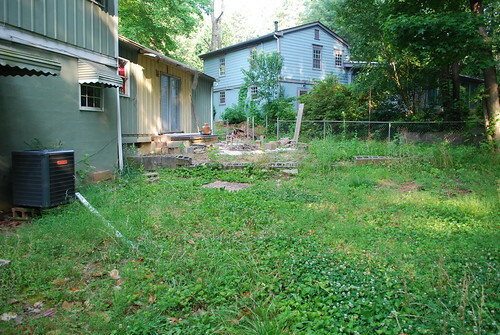 We watered the entire yard for 30 minutes a day every day for one week, then every other day for 2 or 3 weeks. Because we only had one spigot and one sprinkler, we had to do it in 4 segments to cover the whole yard. It took about 2 hours each time! I was glad when we were finished with that obligation. I took the following pictures today, about 3.5 months later. 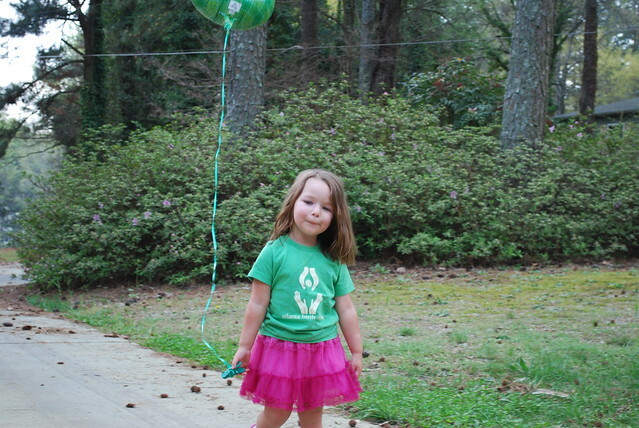 My daughter LOVES running around in the backyard. Some of the grass is really long, and some is still short and looks like “baby” grass. 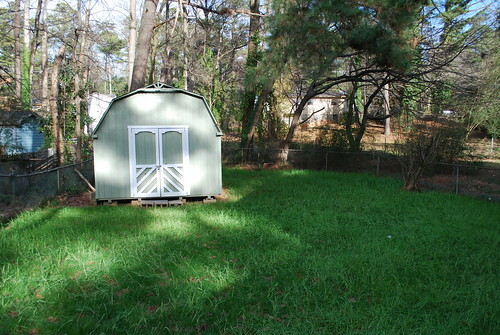 We planted grass behind the shed too, which helped clean up the area a bit. 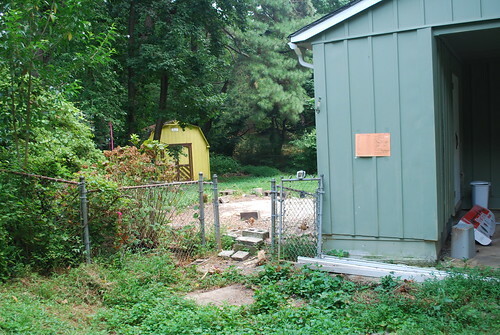 We slowly had to clean up that area the past 2.5 years – there was a LOT of junk and trash back there. You can still see a big pile of cinder blocks (from the old retaining wall) – we tried to stack them as neatly as possible, saving them for future use if we need them. 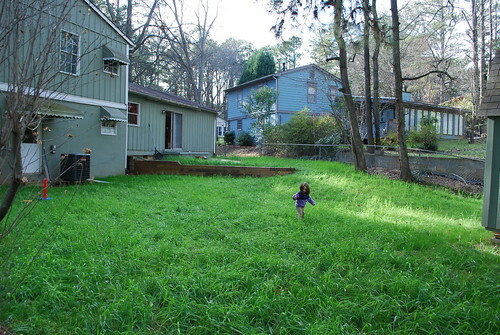 I think we’ll mow it within the next month, getting it all the same length. Then we’ll be able to see the holes and if we need to reseed any particular area. I’ll have to do some research on the maintenance of this grass. 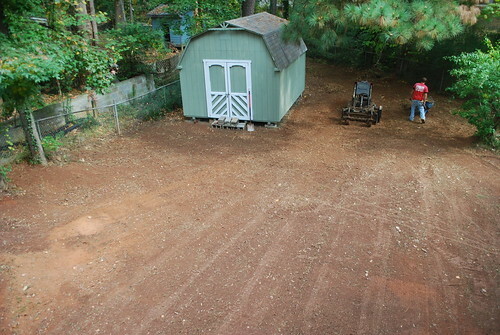 We had to do our yard in two stages, due to the grass only being able to be planted certain times of the year. First stage was putting in a catch basin and underground pipes to divert the water to the back of our property. They also built a new retaining wall, which I love!! Now that it’s been almost 5 months, I can say that it has REALLY helped. It used to be with every rain, our yard would flood, but I haven’t seen it flood once this summer or fall. It’s amazing to be able to walk out back without our feet sinking in mud the day after a hard rain! 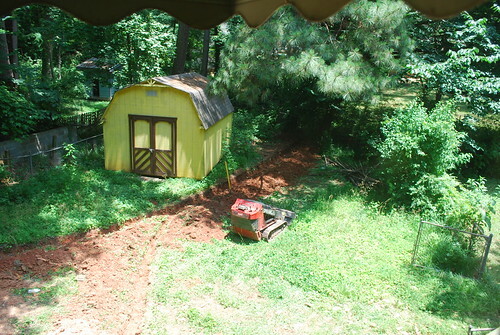 Stage 2 is grading the entire yard and planting new grass. 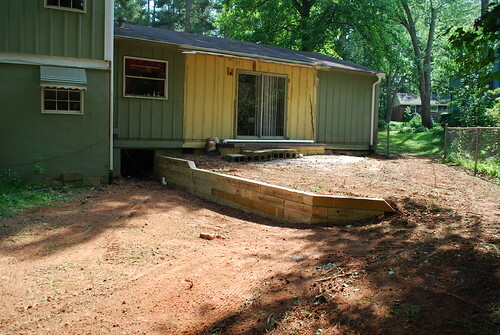 Originally we were quoted the price for sod, but it was out of our budget so we’re going to have them put down seed. I am a little nervous about growing grass from seed, so if you have any advice please let me know! 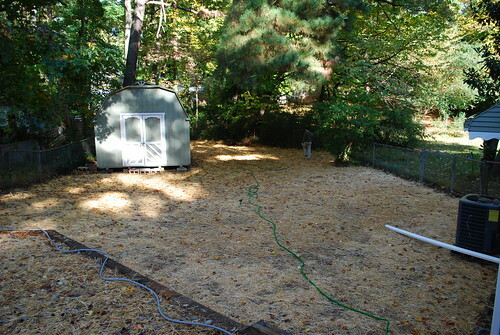 We’re planting fescue grass which apparently is the best for the shadiness of our yard. The landscaper told us we’ll have to reseed every year. A full weekend of painting! 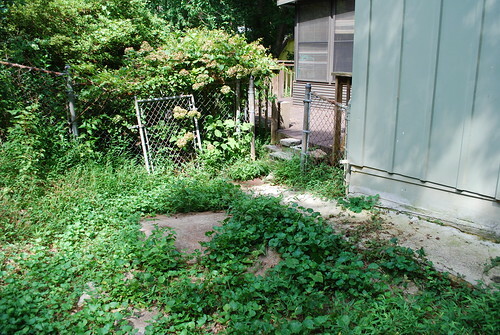 As you can see, the weeds have grown back from the work we had done in June! 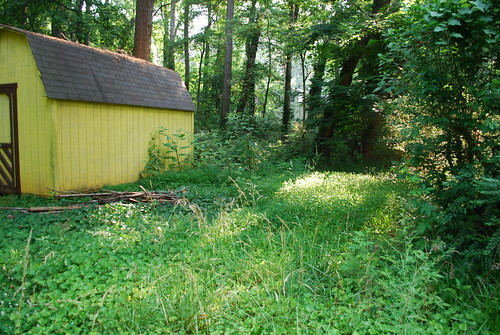 It looks great right now because my dad and Paul spent a lot of time weed whacking the backyard. 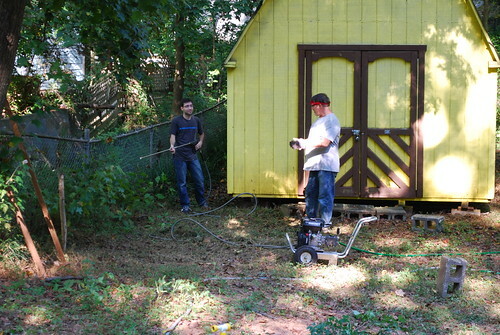 We rented a pressure washer and Paul took care of the siding and the shed a few days before we wanted to paint. Fortunately, Sherwin-Williams was having a great 40% off sale this weekend, so I took advantage. We started with a white primer, which was the only negative of the whole process. I didn’t notice until I got home that it was oil based, and in retrospect I wish I had immediately returned to the store and asked for an exchange. 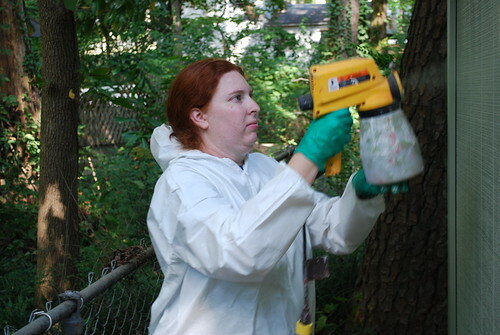 We ended up having to run out to Home Depot twice to get paint thinner to clean the brushes and the paint sprayer. This was my first time using the paint sprayer. It made the job go a whole lot faster, though my arm was sooo sore from holding the heavy, vibrating machine. And yes, I did get a paint suit – I didn’t have any painting clothes that fit me, and I didn’t want to sacrifice another outfit. I loved my suit even if everyone teased me about it looking funny. It kept my arms and legs free of paint! I did as much as I could without getting on the ladder, and then my dad did the rest. I dislike ladders so I was glad he was willing to do that for me. Looking at it, I honestly think it needs another layer of green, so perhaps I’ll get to that someday. I also have a light to put up next to the sliding glass door as soon as I get the chance. 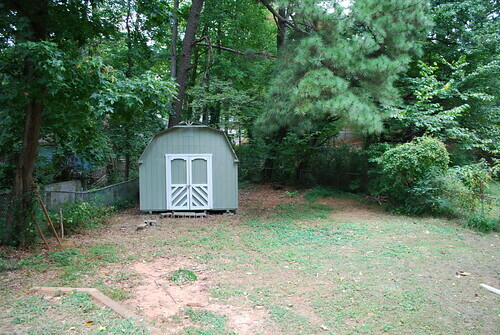 :-) But overall, I think the shed and back of our house look great! We haven’t done much with our house this summer, aside from a few decorative things that I keep meaning to take a picture of so I can post about it. Mostly, our house is just incredibly messy and I keep saying that I need to just go through and do a major decluttering. My parents are here this weekend and they love doing house projects. 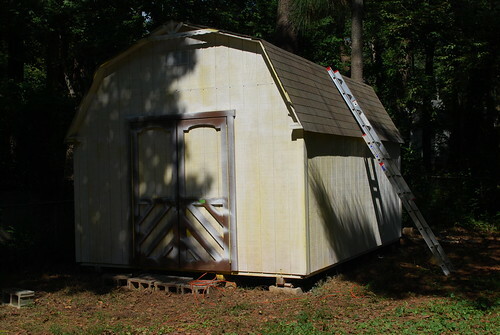 I appreciate the motivation, so I came up with a big project: painting the back of our house and our shed. We are painting them the same color, the green that is the same as the rest of the house. I hope this will make the shed not feel so big and in-the-way! 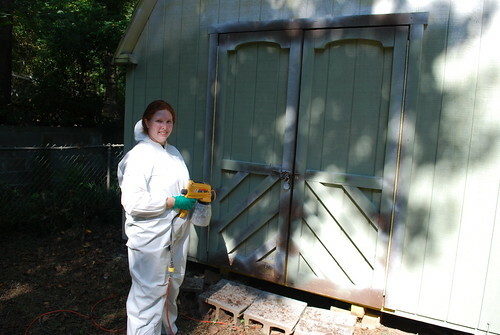 Today we rented a pressure washer and cleaned the shed and the siding, which has made quite a difference. I think I might keep an eye out for pressure washers on Craigslist because I could see it being quite a useful tool! 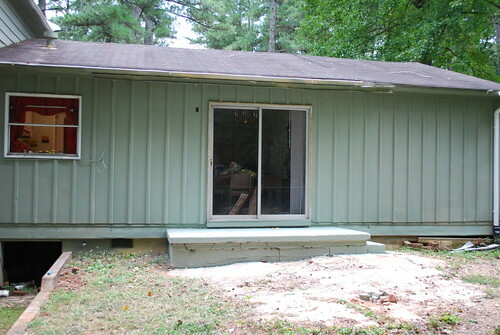 Tomorrow we are going to attempt to get as much of the junk off the siding as possible around our sliding glass door. 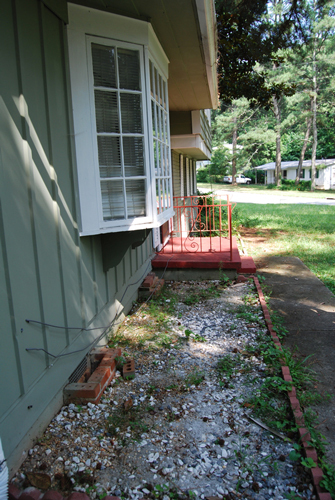 As you can see from the picture above, there is a lot of stuff leftover from when the porch was put on the house. We guessed the porch was put on at LEAST 20 years ago (based on what the neighbors have told us), and more likely it was more like 30 years ago. They used something similar to Liquid Nails it appears, and even pressure washing didn’t make it budge. We talked to the guys at Home Depot and they recommended an old fashioned scraper and sand paper, at least to get it off enough to make the paint stick to it. That will be the project tomorrow, and Monday will be painting day. As you can see, it’s quite a big painting job so we’re going to rent a professional paint sprayer to make our day easier. 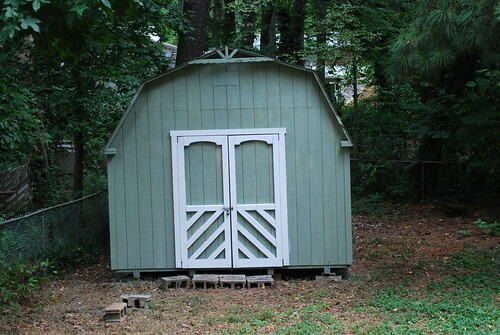 I plan to paint the entire shed green, and the trim (the parts around the door that are currently brown) will be painted white to match the house. I am excited! 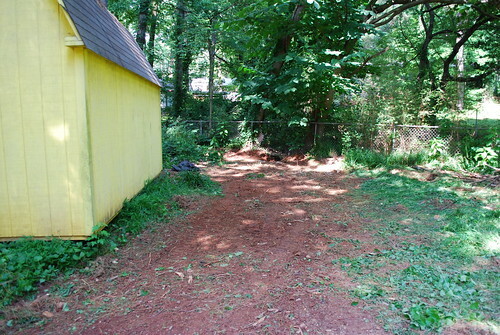 We need to call the landscaper and schedule their return to grade our yard and plant grass back there. 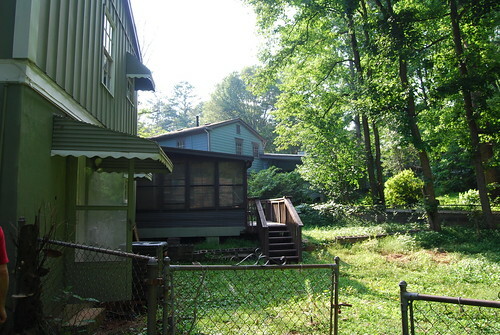 That’s next on the agenda and will have to be done by November 15th I believe (before it gets too cold), but I need to look at our finances first and make sure that we’re still okay to move forward with this project. 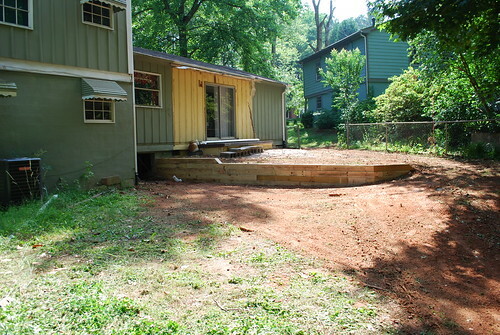 Oh, in addition to pressure washing today, we also spent a lot of time in the yard. Paul weed-whacked, my dad raked, and I mowed. 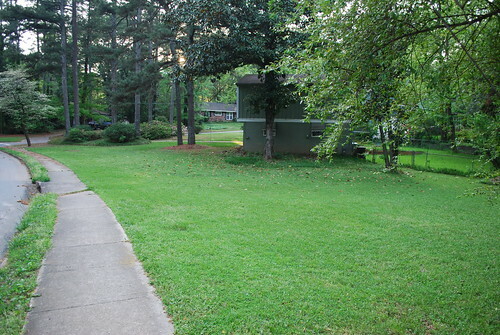 Our yard looks great! 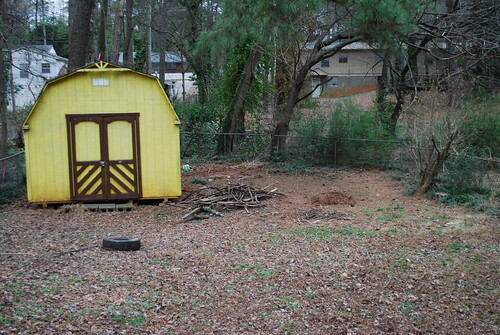 We still need to bag the leaves and pine straw, but already it is looking so much better. I would like to see the area under the magnolia tree cleaned up a bit, but other than that I’m really pleased with how it all is turning out. 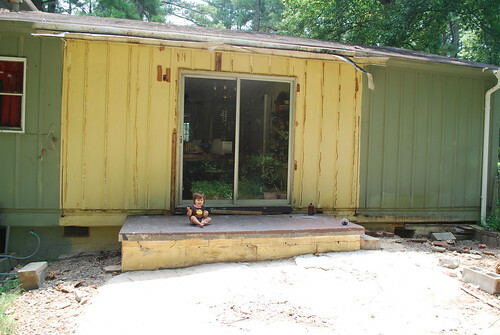 We took the porch down last summer. Another angle; I took this picture yesterday. 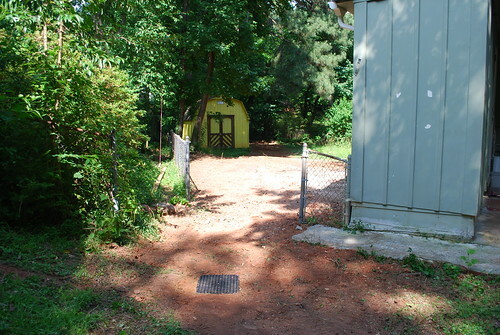 You probably can’t tell, but we also removed part of the chainlink fence. Our backyard looks kinda trashy, doesn’t it? We didn’t really do any mowing or cleaning, in anticipation of the landscapers working on it. What a change! 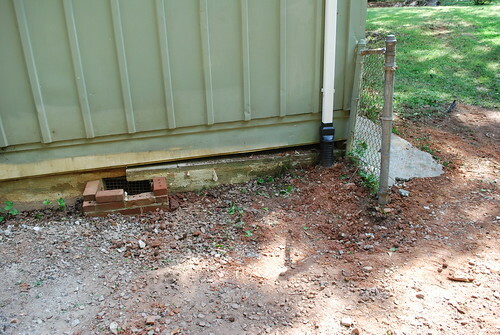 Here is a picture of the spot where the water always collected, and the previous owners tried to fix it by putting pieces of cement there. Now we have a catch basin to take the water in a pipe underground and deposited in the dry creekbed at the back of our property. 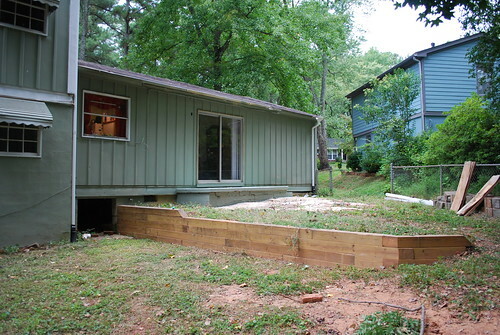 They also removed the fence posts for us. I took this picture as they were working, and here you can see the ditches, waiting for pipes. We had underground pipes attached to our two downspouts and to the catch basin, taking water away from our house and hopefully preventing further foundation damage. A closer picture of the retaining wall. They did a nice job, didn’t they? 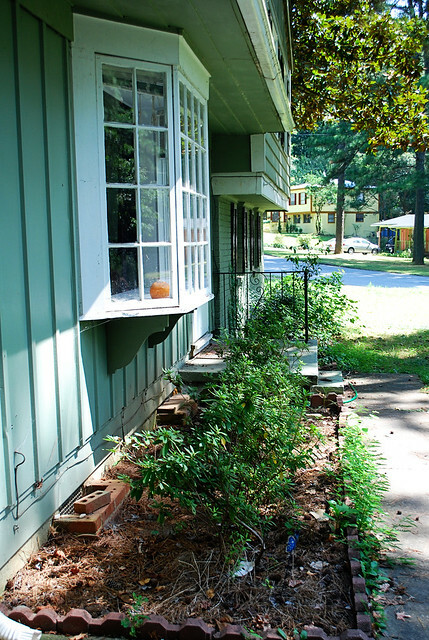 Our foundation still needs help – that is the bigger project we’re saving up for – but at least this downspout won’t cause any other damage. Can’t wait to see it all with grass! 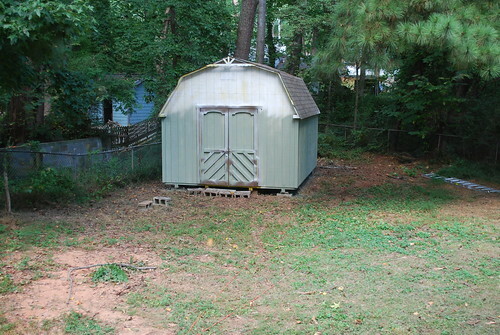 And I’ll have to work on painting that back side, and then we’ll have a lovely little backyard to spend time in. Does anyone know if you have to watch daytime max temperatures for outdoor painting like you do minimum temps? 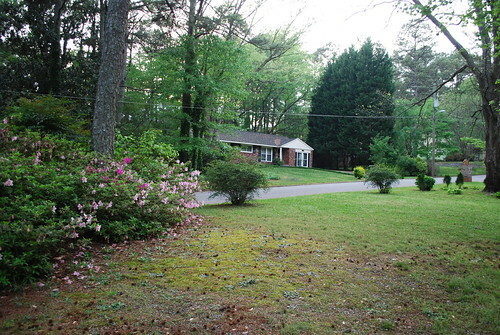 Oh, one thing – they aren’t going to grade the yard until the fall, when we can plant grass. (Apparently for fescue grass, you have to wait until it’s cool enough. I think mid-September is the magic date in our area.) I wish we could have gotten it all done at once, but we waited too long to take care of it before summer!